Toby Jones is not your average cricket fan. It isn’t his passion for the game that makes him unusual – it’s his ability to travel through time, back to the great matches of the past. Toby is playing for Australia in a junior Ashes match at the Melbourne Cricket Ground. It’s the most important game of his life so far. But things take a dramatic turn when one of a band of sinister soul-snatchers – known as Grubbers – makes a ghostly appearance in the outfield and takes over the body of one of the England players. To make matters worse, Toby discovers that his friend Georgie has gone missing. 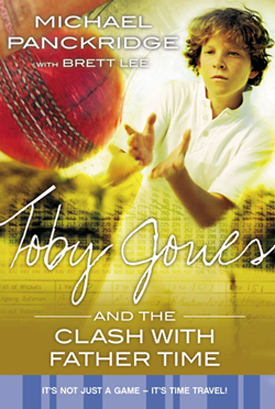 Toby must return to the Timeless Cricket Match and confront the powerful and evil Father Time. Only by doing so can he save all the former and future Test cricketers doomed to be trapped in the past forever… and the game of cricket itself. A thrilling conclusion to the bestselling Toby Jones series.